After a week of all work and no play, combined with all rain and no sun (well, almost), it was time to get out a bit and breathe some fresh air. 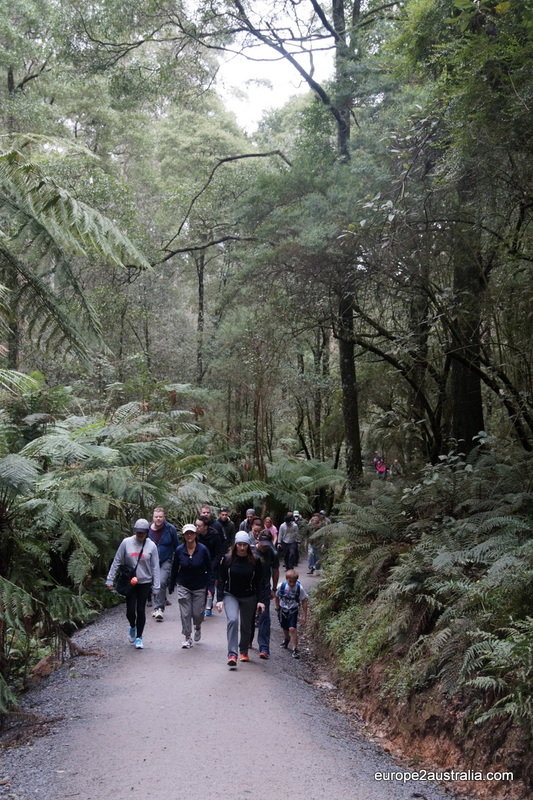 And since the Dandenong Ranges are so close, we decided to go there again, this time aiming to complete the 1000 Steps Kokoda Track Memorial Walk. 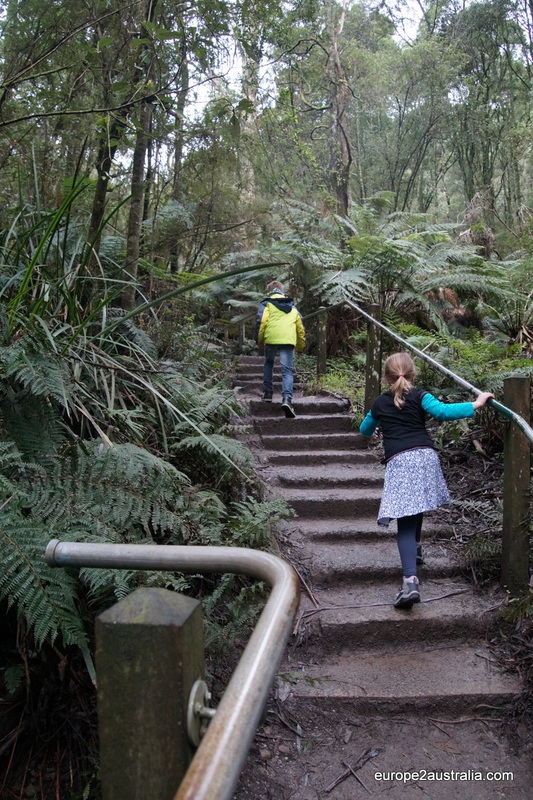 The 1000 steps walk is one of the more famous nature hikes in the Dandenong Ranges, or anywhere in greater Melbourne. It was therefore no real surprise that we were not the only ones on the path. We did not even make it into the car park and had to put the car to the side of the road. One amongst many. 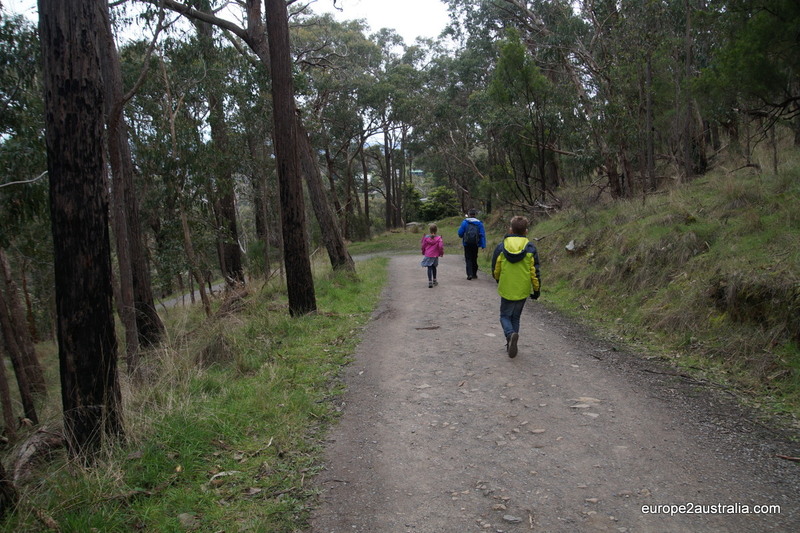 The hike starts with a few hundred meters of hard surface road. 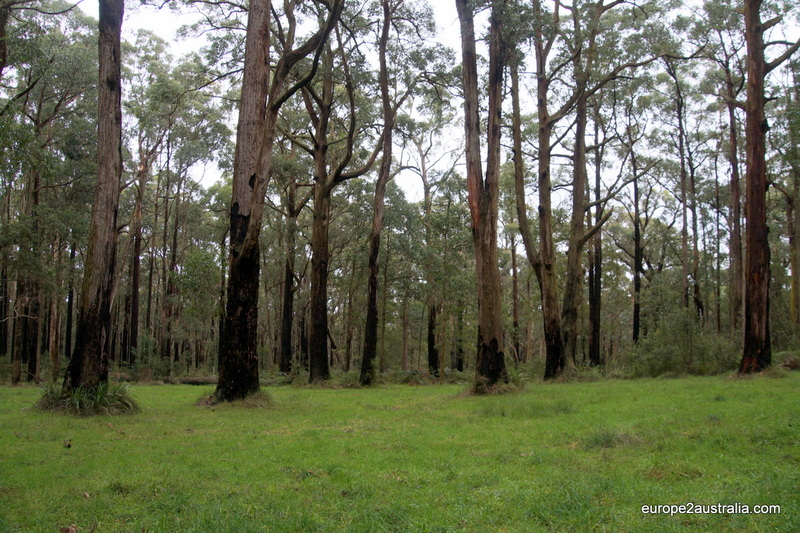 As we have been to the Ranges before, we were decked out in hiking boots and jackets. It turns out, most of the other people here don’t see this path as hiking through the mountains, but rather a bit of a fitness trail. We therefore saw a lot of sport shorts, tights and sneakers. And by a lot I really mean A LOT. 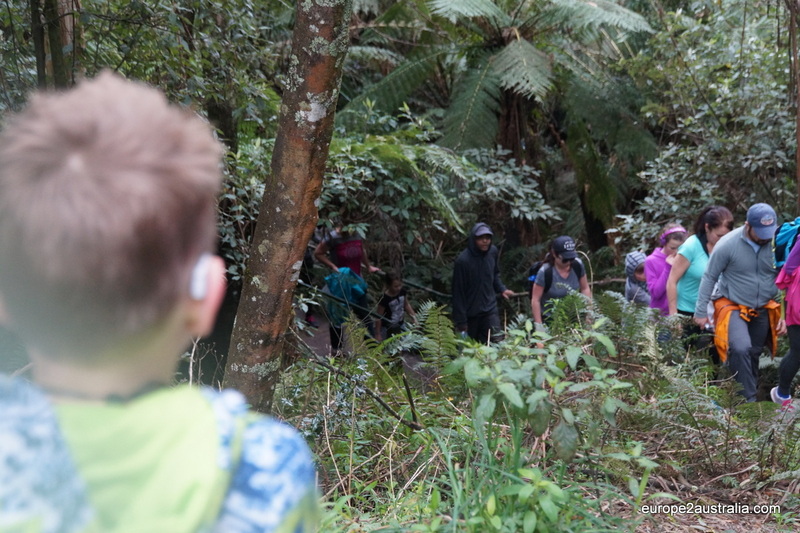 Hundreds of people were making their way up the mountain. Up the steps. Kai raced ahead, while Luka took it a bit slower. But in the end, both made it all the way to the top. Kai and me were waiting at the top of the stairs when the ladies showed up. The top of the stairs was also the point where most people turned left to head back down the mountain. 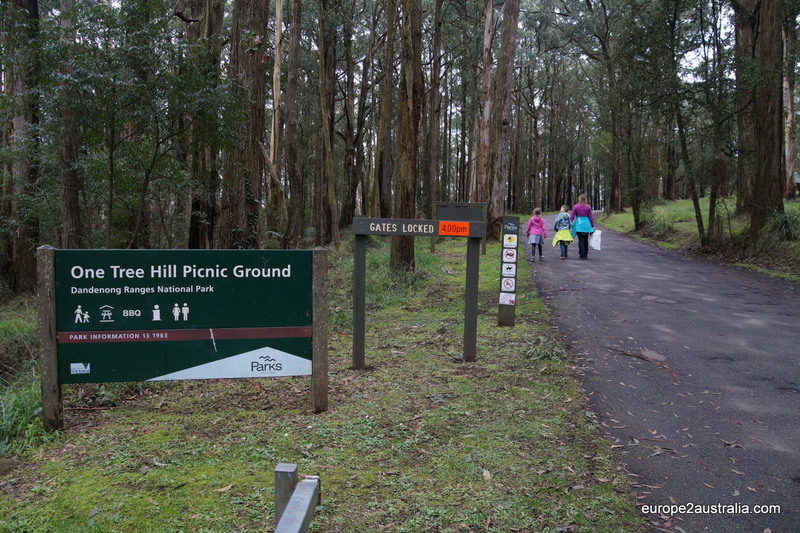 This suited us just fine, as we were able to leave the crowds behind and make our way to the One Tree Hill Picnic Ground a few hundred meters further along. Lunch is in sight! And a lot less people. The trees are quite beautiful up here. The wet weather we have been having has turned everything a lush green. 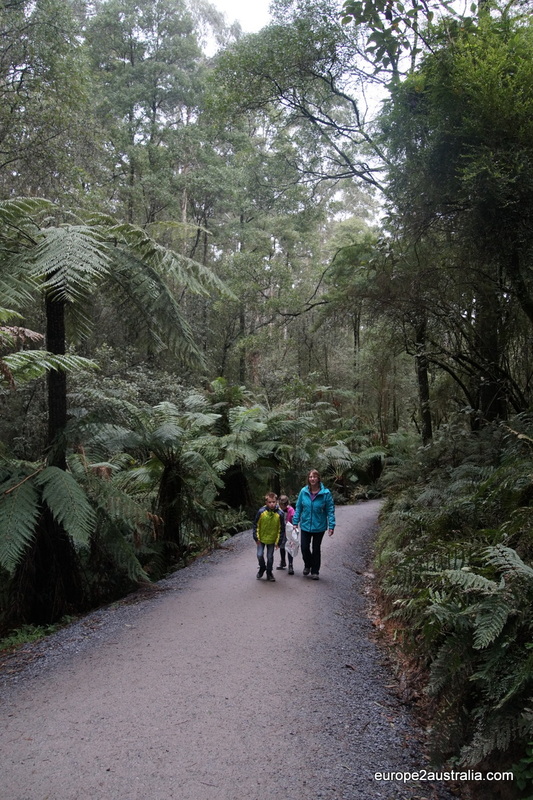 From the picnic grounds its a looooooong decent back to the carpark. All in all it was another great day outdoors. By driving less than 30 minutes, we can have our own mini-vacation and get away from the big city. The kids really seem to enjoy this as well, even if there is the usual nagging before we finally get going. But once we’re under way, it’s big smiles all around. I just wonder how the area will change come summer. There are enough forrest fire warning signs around to make me believe that all this can actually become very dry. I can’t wait to find out. Schön, dass Ihr die Umgegend erkundet und so aktiv seid. Im Sommer seid Ihr dann vielleicht mit weniger Leuten unterwegs -die sind dann am Strand und Joggen, Surfen etc.. dort.